Preheat oven 375 degrees. Cut 1 (24 inch) tin foil and place on sheet pan and spray tin foil with cooking spray. Place potato wedges on tin foil and drizzle with olive oil, toss to coat well. Season with salt, pepper, onion powder and roasted garlic and herb seasoning. Wrap foil and seal edges tightly. Bake 30 minutes. Open foil carefully, add cheese and bacon and chive seasoning, and bake another 5 minutes, until potatoes are tender. So simple. So deeeelish! Love this and that extra touch of bacon and chive dressing! I can imagine these being great with lots of things! Potato wedges good with hamburgers, cheeseburger, chicken, fish sandwich and so much more. Perfect for Sunday family get together! 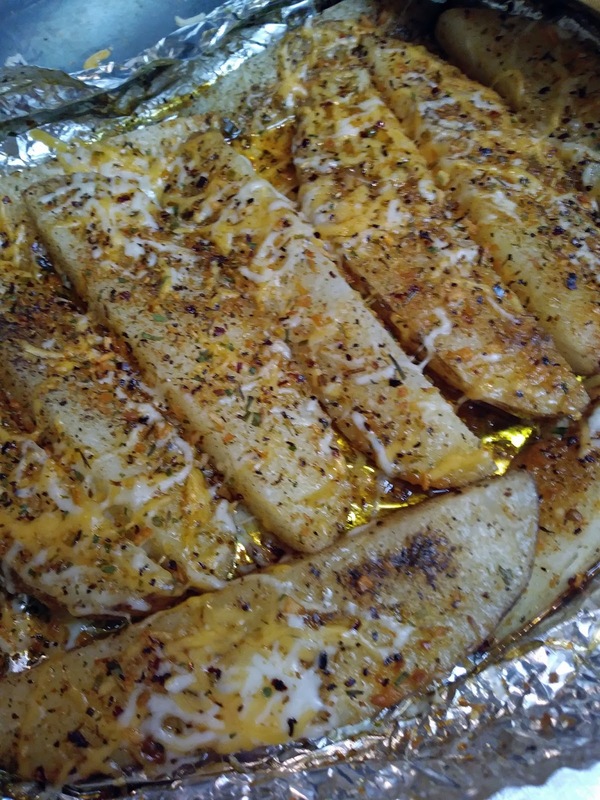 These cheesy potato wedges sounds sssooooo good, Christine! I love this kind of thing! Pinned & Tweeted!